[S]he had not formally backed the bill, which would bar any new vehicles from participating in services like Uber and Lyft until the city completes a study on their impact on traffic. Nonetheless, she said she sympathized with the underlying anxieties behind the proposal, and cited city Taxi and Limousine Commission surveys that found the services brought 2,000 additional cars into the city, and noted concerns about clogged streets and increased exhaust emissions. Companies and industries fail when they stagnate from an innovation perspective, and when they stop listening to, and caring about, the end consumer. At its best, capitalism solves a problem by disrupting an old and broken system and creating in its place something new and useful and better. The taxi system is the very definition of an old and broken system. 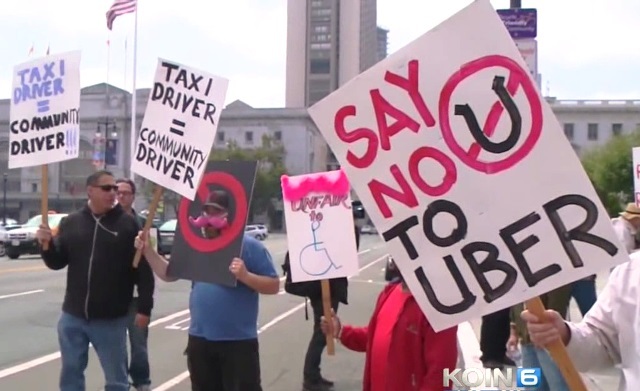 Uber has been attacked by the heavy hand of regulation from California, all the way to Louisiana and Virginia, not only attacking the business owners, but in the process hurting the independent contractors consisting of Uber's driver army, putting them out of work. Uber and these services operating without the shackles of regulation are helping many Americans become their own bosses and work on their own terms. In the process, they can become financially independent, as distinct from the growing number of Americans signing up for welfare and long-term unemployment benefits. Uber spokeswoman Kristin Carvell gave a statement to Forbes a while back to discuss the growing popularity of app-based services, as they appeal not simply to a varied consumer market, but also the hordes of individuals flocking to work, and put skin in the game for these opportunities to earn an honest pay. The fact is, the only reason Uber and others of the same ilk are under attack is because a handful of companies are afraid of losing business, leaving influence over legislation as the only way to prevent competition from flourishing. The market has chosen to utilize Uber instead of taxis with medallion monopolies, and to limit consumer access to these growing technologies is to attack the willing customer itself.